Premier Dwight Ball announced a preview of his 2017 budget Friday morning, outlining billions in infrastructure spending. The Newfoundland and Labrador government announced a plan Friday to spend close to $3 billion to improve roads, schools, health-care facilities and affordable housing over a five-year period. 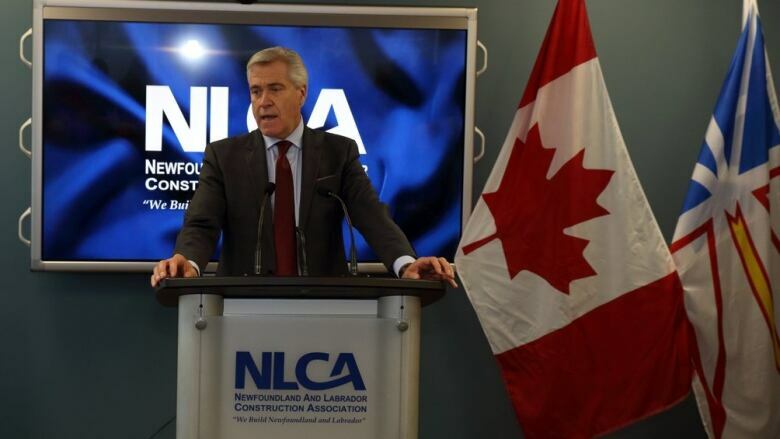 "These projects will spur economic development and growth and foster business development while also strengthening and supporting our communities," Premier Dwight Ball said in a statement. During the five-year plan, $688.2 million will be spent on transportation infrastructure — including roads and bridges — and $553.9 million will go towards major health-care projects, repairs and maintenance. Projects receiving money include a new science building at Memorial University, a wastewater treatment plant in Gander, the extension to Team Gushue Highway and the already announced long-term care home in Corner Brook. The plan also includes a partnership with the federal government for municipal buildings, recreation facilities, local roads, and water and wastewater projects, according to the release. About $300 million of the total will be devoted to education — including post-secondary facilities — and $86.5 million will go towards repairing, maintaining and modernizing affordable housing units. In addition, $750 million is dedicated for projects not yet identified under the second phase of Canada's new infrastructure plan. The statement said the plan will be updated annually to reflect priorities, with details released before each year's budget. "Multi-year planning provides better value for money, a critical consideration in the current fiscal climate," Finance Minister Cathy Bennett said in the statement. "In addition, as an integral piece of the planning process, we will seek every opportunity to leverage federal infrastructure funding to support and maximize provincial priorities and investments."